Russia's New Wars: Why Is Putin Picking a Fight? 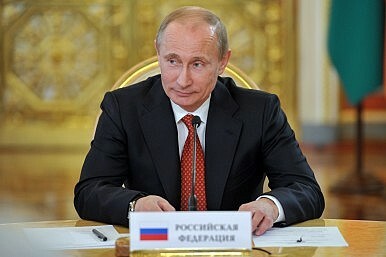 The assertive Russian leader has laid out his intentions very clearly in his speeches. Will the world listen? The official state seal of the Russian Federation features a double-headed eagle. One head faces east while the other faces west, indicating Russia is a country with a split identity, both European and Asian. This ancient symbol is also an apt descriptor of recent Russian actions in Ukraine and Syria. After decades decrying U.S. military modernization and intervention overseas, Russian President Vladimir Putin is embarking duplicitously on his own modernization efforts during multiple foreign interventions. Now the incoming Chairman and Vice Chairman of the Joint Chiefs of Staff, President Obama’s top military advisers, have both called Russia the number one threat America faces. Policy analysts are debating whether further Obama-Putin summits would help or hurt relations. But as any experienced diplomat knows, those who discern the most about their adversary’s strategies and intentions will have an advantage. Before any more U.S.-Russia summits take place, U.S. diplomats need to know who they are dealing with. Since the conflict between Russia and Ukraine began in early 2014, Putin’s speeches on national security have emphasized three major repeating themes: the supremacy of Russia’s national interests, an expectation of conflict, and the encirclement by foreign enemies. By analyzing each theme in turn, we may gain a greater understanding of what Vladimir Putin believes, what motivates him, and what actions we can expect. International peace and stability are desirable goals to the Western mind, but these concepts are subservient to Russia’s national interests according to Putin. Compliance with major arms control treaties is extremely important in the West, but again, compliance in Russia serves only one master: the national interests of the fatherland. Putin apparently considered placing his nuclear forces on alert during the Russian occupation of Crimea in order to protect both national security and economic interests. The Western mind understands using force to protect apparent national security interests, but who was the last European or American leader to consider using nuclear coercion to acquire new territory at a neighbor’s expense? Putin knows that pursuing Russia’s national interests may conflict with other nations’ interests. While this knowledge induces caution in Europe and the United States, it appears to only embolden Putin. In Putin’s mind, conflict is inevitable. It is to be expected, prepared for, and ultimately overcome. A survey of Russian history confirms that Russians have good reason to be fearful of foreign invasions, yet Vladimir Putin is using this fear as justification for his own foreign invasions, noting that without forceful action enemies could advance to Moscow’s doorstep. Putin’s perception of the world is clear: enemies on the borders seek to destroy Russia, conflict is inevitable, and Russia’s national interests must be defended at all costs. What can the West do to counter someone who appears to expect conflict while defending Russia’s highest national interests? The first thing we can do is to understand the threat. Various U.S. officials have expressed disbelief that a national leader such as Putin would be willing to act like a 19th century tyrant in the more “enlightened” 21st century world. Such incredulous statements by Western leaders only reinforces Putin’s perception of the West as full of weak-willed idealists. Second, the West must make sure its counter-actions against Putin will cause him to rethink his commitment to the three themes described above. Vladimir Putin will continue to advance Russia’s national interests until he receives unified resistance. He will continue to perceive conflict as likely, even useful, until the risks associated with that conflict outweigh the potential benefits. He will continue to identify and act against alleged enemies surrounding the fatherland until they are overcome or surrender. As a last instructive anecdote, Putin was recently asked what his favorite movie was. He responded, “Chapayev, of course.” Vasily Ivanovich Chapayev was a common peasant who became a great military leader for the Red Army in the fight against the internationally-backed White Army in the Russian Civil War. In the 1934 Communist Party film, Chapayev sacrifices his life for the sake of revolution, defiant to the end, and dies at the hands of international imperialists that surrounded his soldiers. Chapayev’s patriotism obviously resonates with Putin on multiple levels, but it appears he also absorbed Chapayev’s ultimately fatal flaw: a belief he is invincible. Matthew R. Costlow is a defense policy analyst at the National Institute for Public Policy. His research focuses on nuclear deterrence and assurance, arms control, nonproliferation, Russian and Chinese defense strategy, and nuclear terrorism. Focusing on shortcomings in equipment made Western military analysts underestimate Moscow’s military capacity.